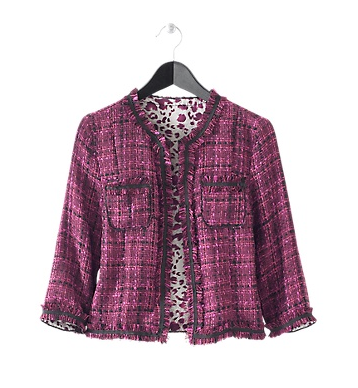 Chanel tweed jacket is on every fashionista's wish list...and I want one really bad. Unfortunately, I'm not inheriting one, nor am I planning on buying one in the near future. Ebay is another option, but you will find that starting bid for vintage Chanel blazers is no less than £500. Brand new items will never start below £2000. If you find one for lower price- let me know! Over the years I bought a number of Chanel-inspired tweed jackets. Just last year I picked up a gorgeous BCBGMAXAZRIA pink tweed blazer and had someone ask me if it was real Chanel ..yeh I wish. H&M had a nice selection of grey & silver cropped jackets last year and I've been wearing them all year round. Marc Jacobs often comes up with Chanel-inspired jackets. I wouldn't recommend his blazers and jackets - they are often too bulky. So until I win the lottery, will be buying High Street imitations... The below Spiegel polyester jacket is super cute and is bound to look good with pencil skirts, wide leg pants and jeans.